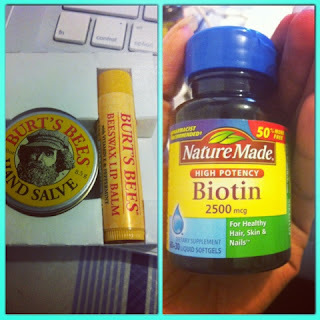 Back in December I posted a photo on Facebook of the Biotin vitamins I had just purchased. For those of you that do not know Biotin is a vitamin for your hair, nails and skin. I began taking the Biotin in January, now about two months later my skin looks AMAZING! My skin hasn’t ever been too much of a problem for me ever but the Biotin is helping out more than I ever imagined! My skin looks brighter, clearer, and in the cases that I forget to wash my face one night itdoesn’t get all-horrible and forbidden looking in the morning! To be honest I do not see much of a change in my nails. They might be stronger…? Not really sure. It looks SO GOOD. Again I don’t really take care of my hair but this Biotin is working miracles! My hair is growing, has less breakage, and shines even when it’s way past my over due wash. If any of you are looking for skin, hair, and nail help I suggest you pick up Biotin. Come to think about it… I haven’t done a giveaway in a long time. Comment below and let me know if you would be interested in aBiotin and maybe face wash giveaway…?